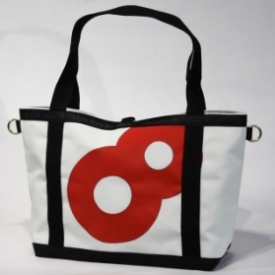 Sailcloth is great for bags for on or off the boat! In the latest installment of the Daily Boater's weekly Marine Product Review, Mark Sutton of MarineProductReviews.com tested the Ella Vickers Yacht Club Tote, which is made in the USA out of recycled sails. MarineProductReviews.com recently had the opportunity to review the Ella Vickers Yacht Club Tote. Two things stand out about this bag are the outstanding looks and the obvious quality of the bag, which was made from very sturdy sailcloth material. The Ella Vickers line of bags are constructed from sailcloth that has been used aboard a yacht and recycled. The sailcloth material is beautiful, thick, crisp and clearly genuine. The quality of these bags is apparent in the brass rings and clip, as well as the recycled webbing handles and trim that come in a variety of colors. The nautical flags stitched into the outside pocket of the Yacht Club bag add even more style. The bags also come standard with a random number on the outside of the bag (I have #5 on mine!). However, if there is a specific number that you like, you can order that for a small extra charge. The Yacht Club sailcloth bag from Ella Vickers has three interior pockets, a clip for your keys and the inside has a water proof lining. Ella Vickers items are all made by hand from reclaimed sails from all over the world. The items are beautiful and eco-friendly as over 20,000 yards of old sails are saved from the Davy Jones landfill annually. Ella Vickers actually buys used sails - everything including White Dacron sails, Kevlar sails, spinnaker sails and even Tanbark sails. This is a great thing to consider when you are ready to swap out sails. Rates are $.25/sq. ft. to $.95/sq. ft. You can make a little money while getting your sails reused. Even better, the money can even be donated to any charity of your choice. While Ella Vickers is best known for their sailcloth tote bags, they also make a full range of other innovative products from recycled sailcloth. These bags fit in perfectly either onboard or in your favorite restaurant. The bottom line is that if you are looking for a sailcloth bag and want quality, Ella Vickers is an outstanding choice.